We’re talking about the iconic and exhilaratingly colorful packaging of Ernie Ball’s Slinky guitar strings – each vibrantly designed pack representing a different string recipe/gauge. For more than 55 years, the biggest names in music have used Ernie Ball Slinky Pinks, Purples, Greens, Reds, Oranges and Blues to write, record and perform some of the most important songs in rock history. Ernie Ball’s pioneering packaging and revolutionary string recipes have become the best-selling and most popular guitar strings in the world. 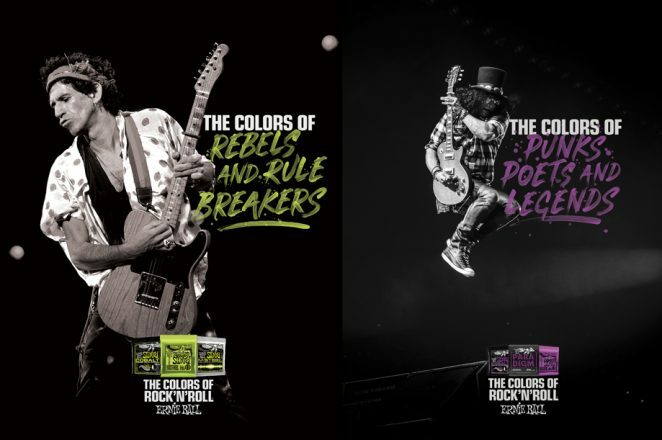 Today the company celebrates its history with “The Colors of Rock ‘N’ Roll,” a campaign featuring limited edition artwork created in collaboration with Ernie Ball’s award winning in-house creative team and acclaimed designer Aaron Draplin of Draplin Design Co. (Nike, Esquire, Ford Motor Co, Red Wing). The Southern California-based Ernie Ball has a history of collaborating with notable artists, including Luke Cheuh and The Pizz. The original Ernie Ball font and design elements were created by the legendary Roland (Rolly) Crump, a high school classmate of Ernie’s who went on to work on classic Disney films, then later designed some of Disneyland’s biggest attractions. An equally important part of the celebration is the announcement of the 2018 Slinky “Back of the Pack list – one of the most sought-after achievements of guitar players worldwide, spotlighting a who’s who list of rock &’ roll. The lineup is updated annually and today Ernie Ball has revealed a new list featuring 162 of the company’s most influential guitarists, multi-platinum artists, Grammy winners and exciting new voices ranging from Paul McCartney, Pete Townshend, Steve Vai, John Mayer, Metallica’s James Hetfield and Kirk Hammett and Slash, to St. Vincent, Mac Demarco, Courtney Barnett, Ryan Adams, and The War On Drugs, among many others. This all-star lineup is featured on the flip side of each pack, which now comes in a brand-new metallic packaging.